Since I cant find the info here or on the Intel site... Does anyone have the board dimensions? preferably with the edison mounted to it. It's not stackable, but combines the gpio and console block for the price of one. Hardly. I ordered it and chose next day, and received it next day. Then a week later i turned around and bought the Edison Arduino kit from them. 3 days later i received that as well. I choose to use my money wisely, if a popular company like them has the kits in stock and at a lower cost that is where I am going. I support SparkFun, but have been a Newegg customer for years, and have never had a problem or complaint. The one time I did have a problem, it wasn't their problem, but they resolved it. Quick (possibly stupid) question: how is the mini breakout board powered? Do I simply apply 7-15V on J21 or can I power it via USB? 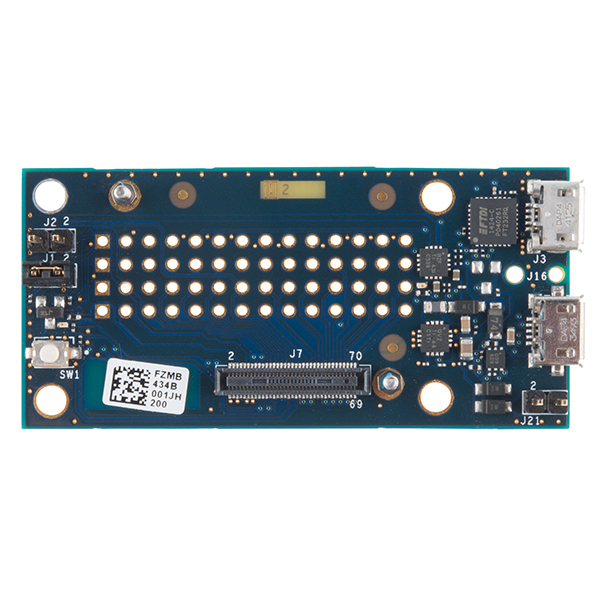 Is there a "Getting Started" for this board (not for the Arduino breakout)? I followed the getting started guide for the arduino board and it work (skipped the arduino parts). You can power it from USB alone via the otg port, but external power is necessary for running as a USB host. 7-15 Vdc on J21 or a LiPo cell on J2 (iirc - check the schematic). $74.95 seems a bit expensive. I try to support SparkFun whenever I can, and I usually don't mind spending a small premium on products to support their good work, but Frys has the same product for $59.99 and free, same-day shipping. Can I stack other Edison Sparkfun blocks onto this? Can I stack other edison blocks onto this? Wish I could just get the breakout kit without the Edison, I already have and Edison and Arduino kit but want the smaller one. What is the Difference Between this and the Edison Blocks? (Sorry this may be a dumb question). Itâs not stackable, but combines the gpio and console block for the price of one. This is a quick start breakout kit (ie. similar to an arduino but not an arduino, also this breakout kit doesn't have it's own microcontroller (that's what the edison is for!)). The blocks work without a breakout kit. To power the edison, you will need a block which will supply power to the edison. If you want to use pins on the edison, you will need another bock which will break the pins out for you to use. So, to do anything special you will need another block. With the breakout kit, all you need is the breakout kit and it has a USB port on it for power as well as locations to solder on pins or a socket of your choice. If I've got my Edison connected to this, will I be able to fit the Sparkfun Battery Block on there too? Does anyone know the range of the wifi on these? I understand that unless you want to solder wires directly to the prototyping area, what type of connector would the most appropriate to get access to the full array of connections (4 x 17) from under the breakout? A quick question, since you will soon have the modules in stock, i would like to buy one, however what i really need is the entire kit (mini). Can i buy the module now and the mini breakout later, or do i have to buy the breakout as a kit? Both breakout boards can be purchased from Mouser. Maybe Sparkfun will carry them eventually. I see nothing on Mouser except "on order". 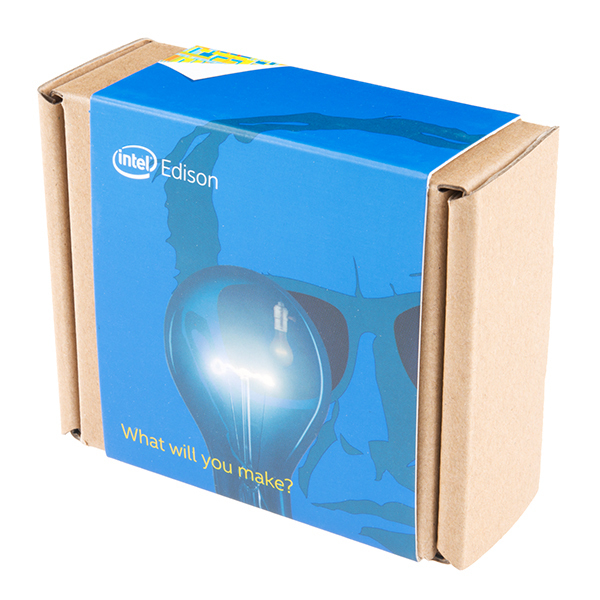 The kits come with the Edison and are prepackaged from Intel. I don't know if they are selling the mini separately, but we don't carry them without the Edison. 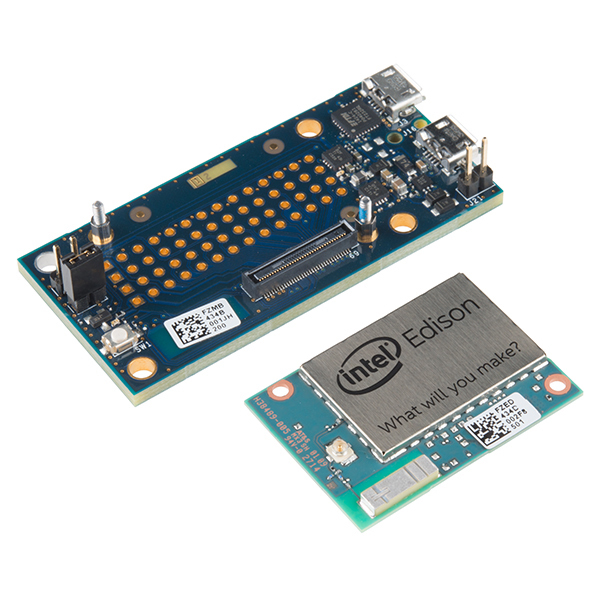 But at this point you will need the mini or the Arduino board to be able to do anything with the Edison since we don't have any of our boards ready yet. Can the breakout USB be used for the console, replacing the need to get the Console Block? I am unclear about what you mean by the "breakout USB". If it is the breakout on this page, then out of box one usb can be used for uart/usb kernel debugging and the other as an rndis gadget device (usb, storage, etc). In case anyone's curious about the power supply on this thing, it looks like the Edison alone uses about 1W (3W when actively transmitting on wifi). This board takes 7-15V in, 5V from USB, or 3.15-4.5V from a Li-ion battery (which it can charge at 190mA). It has a 5V 1A regulator on board that supplies the Edison (and peripherals?). I know it's a bit early to ask for things, but can we please get a better view of the GPIO headers on this breakout? It looks like 4 of the 20 are showing near the top USB port. The "Product Brief" doc has a good shot of them, but it's a bit small and doesn't have the Official Sparkfun Size Reference Quarter next to it. Perhaps the Spark Fun team would measure (and post) the width of Shawn's distal phalange (index), we could then infer the scale from the video. Better pictures will arrive, in time. All the examples, and the prime photographer, are in San Francisco at IDF ATM. The GPIO is in 4 rows of pins which are completely obscured by the Edison in this picture. The board is super thick, so the bottom of the pins don't protrude through the top and poke the Edison. Also, and this is important, this can't be in a stack with Blocks unless you remove the two headers on the end opposite the USB. It's not a big deal, really; you can short one and leave the other open. 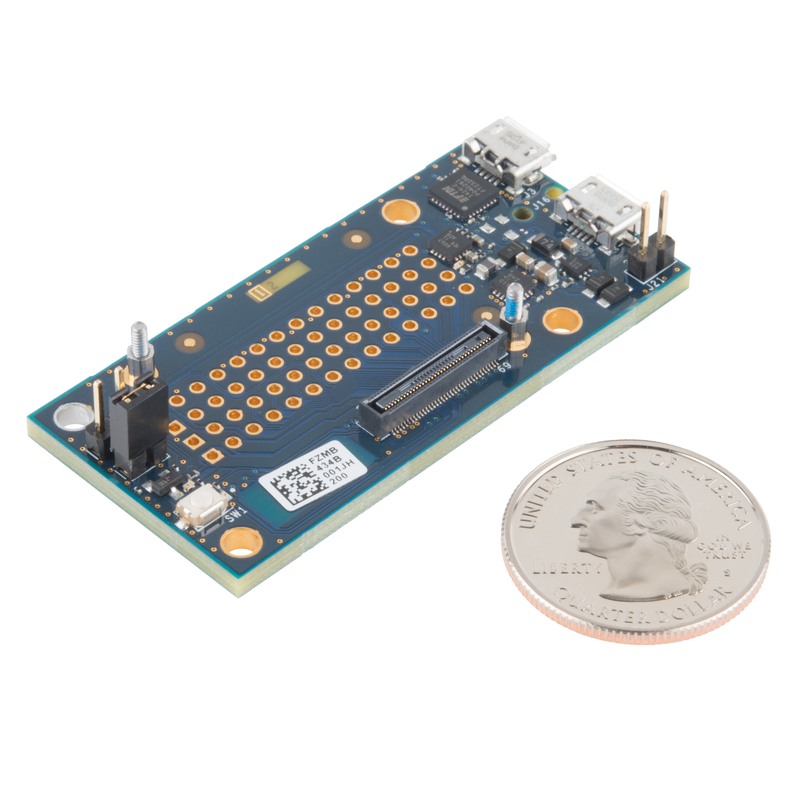 Since this comment was prior to the final release 5 months ago, I'd like to confirm whether the Mini Breakout Kit can be used with Sparkfun Blocks once the 0.1 mm header on the left side of the board has been removed? I'm not sure we actually have these in the building at the moment. I think we got a few quick pictures and now everything is at IDF. We will get more pictures and information up soon though. Out of the box and ready to go, quite a statement and it is true. Wasn't too impressed with the Yocto partitioning so I flashed Ubilinux onto the unit and am now very happy. Loaded Apache, Php, MySql, PhpMyAdmin and now have a complete LAMP server that I can carry around in my pocket. Bought the Sparkfun battery block and now the unit is completely unteahered. I'll be building my own expansion board with the sensors and IO I require for a project I'm working on. With this little compute module running everything, the time to finished product should be under 60 days. Bottom line: Great little device with endless possibilities!! Embedded wifi, Bluetooth, lots of GPIOs, a responsive community, Arduino compatability, built in lipo charger and regulator (with thermistor support!). Quite an amazing piece of kit! Setup is straightforward and all the info you need is right at your fingertips. Linux is well supported, though Mac support is a bit half baked when it comes to flashing via dfu-utils, but for those not needing to replace the OS wholesale, an alternative method via USB mass storage is available. Only thing the standard breakout board needs is an SD card slot, though for most use cases the device has roughly 2 GB available on internal storage for hacking space. Best part: it's all wrapped around an Intel x86 chip, so no cross compiling is necessary for most software -- just drop a Linux 32-bit binary on the device and it mostly just works. Only thing Sparkfun could do to improve upon this: sell lipo batteries with thermistors built in to prevent overheat conditions. Note: The mini-breakout board (m-bb) does not have analog pins like the Arduino Edison board (AEb). If you wish to use analog pins on the m-bb, you'll have to design your own circuit. (The add-on ADC/Arduino Sparkfun boards won't fit with the m-bb). I wish this was specifically noted in the description. 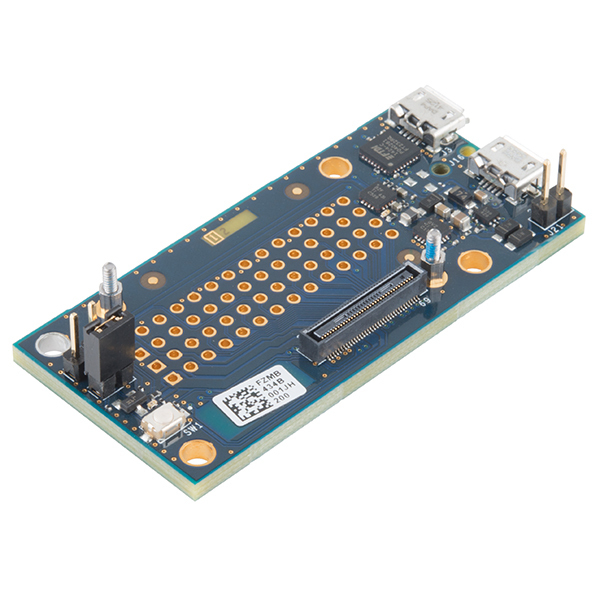 If you're just starting out, consider buying an AEb, or even the Raspberry Pi (RPi). They're way more user-friendly, especially the RPi. 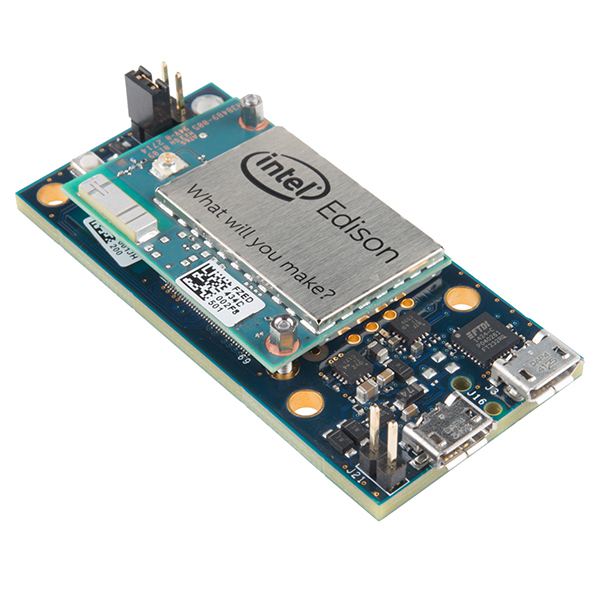 The Intel Edison has a slew of amazing features, (insanely low power consumption, good slew of GPIO pins, built-in wifi/bluetooth, m-bb is very tiny and very light, bunch of great tools already installed [Ex. Node.js! Huzzah.]) but requires a lot more out of the user to functionally use, especially the m-bb version. You will not find a lot of good guides out there, as they're all tailored to the AEb or just don't exist as the community is still new. You will have issues running code, either due it being coded for the AEb (bloody analog pins) or for the Arduino (it has some specific timers and other things related to the atmega328 chip). You'll realize you should have bought some headers, a fine tipped soldering iron, and applied electrical tape to the backside of the Edison shield because otherwise good luck actually using the GPIO pins. You'll find out that although you can hook things up via USB, you'll need a 7-15V power source on the J21 pins to do so. You will find these problems, and many more. But, it's absolutely amazing and you generally have to deal with those kind of problems at some point anyway once you get to complex projects and inventions. For the person with experience this thing is fantastic! I can't stress this enough. And most importantly, it's a good time to get in and help build that community and write the guides for others to learn and build off of. I'm probably going to be buying several over the next year and incorporating them into all my projects, as they're far superior to any other board out there at this price point. If you're getting some other Edison blocks, expect to not be able to use them with this base board. The bottom board doesn't offer any room for them, as the space has instead been utilized by ... jumper headers. Additionally, there is no place to mount a stack, even if you are able to de-solder the jumper headers; the mount holes don't line up. 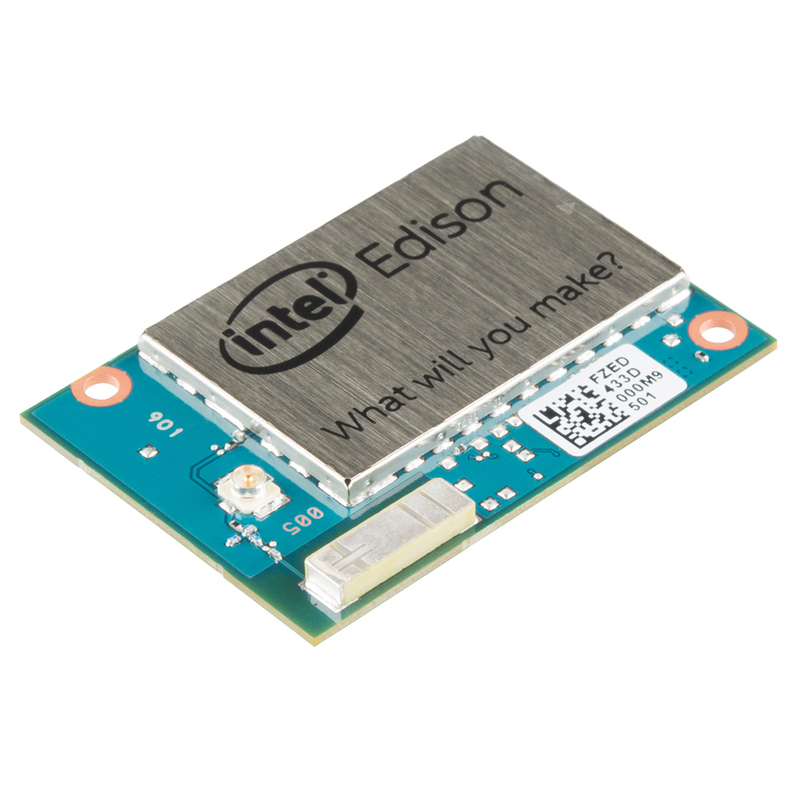 My recommendation is that if you're looking at this, and you plan to use some blocks, instead go for the "SparkFun Block for IntelÂ® Edison - Base" and buy the Edison by itself, since that will allow you to implement your block stack.